For ultimate night time visibility use our 1", 2", 4", 6", or 8" High Intensity Type III tape. 150 foot rolls. 250 candlepower or 4 times brighter than standard engineer grade reflective tape. This material meets or exceeds ASTM D4956 Type 3 requirements for reflective tape. We carry White, Yellow, Orange, Blue, Green and Red. You will find this tape used on road signs, highway barrels, traffic cones, roadside guard rails and in other places where brighter tape is needed. It can be used virtually anywhere. 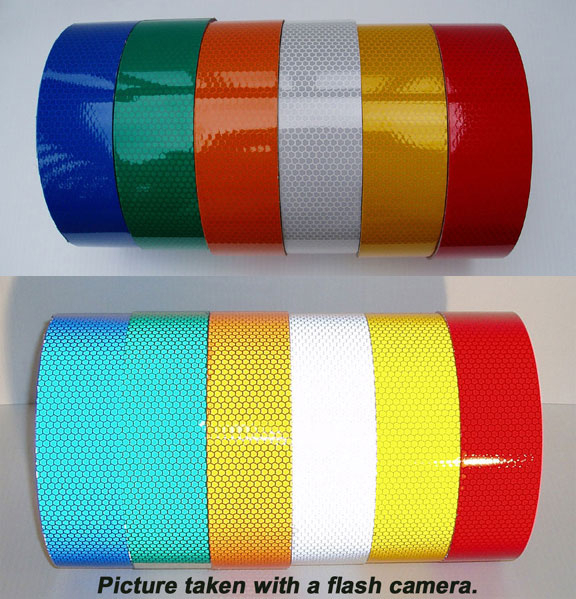 Our High Intensity Grade Reflective tape exceeds all federal and state requirements and is outdoor rated at 10 years. It is easy to apply. Simply cut off the amount you need, peel the backing off the tape and apply to a smooth, clean surface. This tape will bend around curves but does not stretch like our flexible engineer grade tape. We have a flexible version of this tape at the link below. You can make your color and width choice below using the drop down menus.